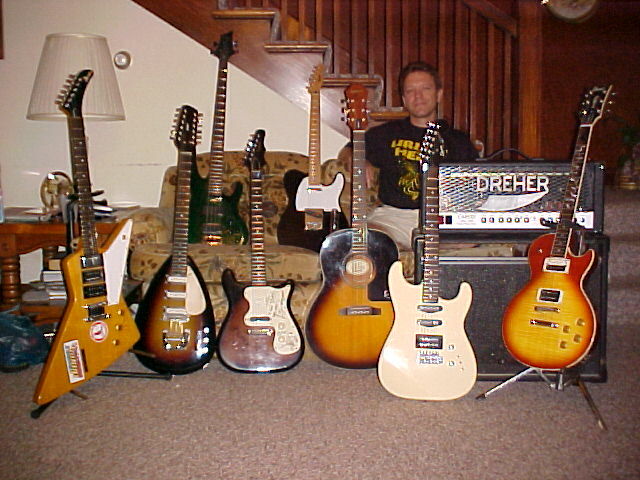 My name is Bob Dreher and on this page I will list and show pics of some guitars that I own and some of my friends guitars too. If you would like to listen to some of the music I've made with my friends, please check out these songs. The latest recording project that I am involved with is Heepheads . We released our first cd titled "Broadband Conspiracy" on Feb 23, 2004. You can listen to samples and purchase it here. 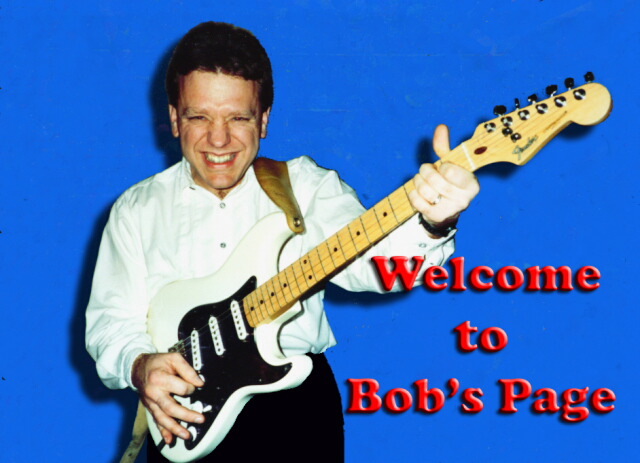 I have been playing guitar since 1963 and I dearly love Rock & Roll, and The Beatles and Uriah Heep in particular. I have played in many bands over the years, and I am currently semi retired from live playing, keeping busy recording original music here at home. Blind Date was my last band and it lasted for 10 years. Below is a pic of me in about 1964/65. This was my first guitar, which I still have. It is a Harmony and was a childs size guitar. I learned alot on this little bugger. All you kids out there, you don't need alot to learn on, just desire! If you have to have the best of everything just to play good, you're not gonna make it. You will never be satisfied, take that from almost 40 years experience. Desire is the key ingredient!! I have had the pleasure of getting to meet some of my heroes in the music biz, most notably the members of Uriah Heep...especially Mick Box and former member Ken Hensley. Below are some pics. 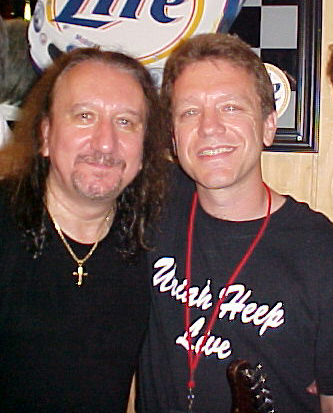 Here is a pic of me with Mick Box taken in Indianapolis on June 13th, 2001. That night I saw Heep perform for the first time since 1978. I was totally blown away by the current lineup. Mick is the model of the professional guitar player. I can't say enough about what a great guy and awesome performer he is. Here I am with Warren Haynes, one of the alltime guitar greats with the Allman Brothers and Government Mule, and Ken Hensley. Kens songwriting has been a great influence on my own songwriting. 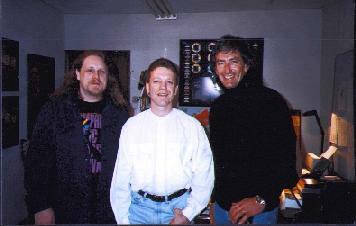 This was taken at Kens office at St. Louis Music in 1995. Ken was looking to buy my 1955 Gibson Les Paul at the time. 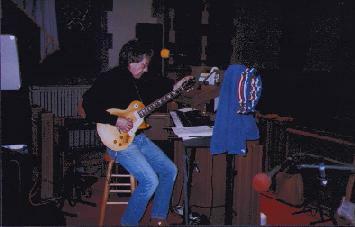 This is a pic of Ken trying out my Les Paul at his church where his band was rehearsing. So to kick off the guitars on this page I will begin by showing you my Hofner Beatle bass, circa 1979. This is obviously the same type of bass used by Paul McCartney of The Beatles. This is a pic of me in July 2002 with my new baby. Here is a pic of my home setup for recording. Tucked away in a corner of my dining room, it is not pretty, but gets the job done. I am working on turning part of my new garage into a 14' x 28' studio area. 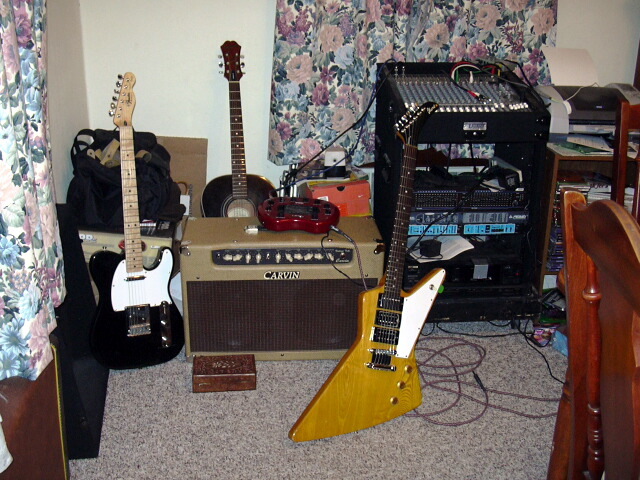 In this pic you can see my Fender Tele, Epiphone acoustic and Ibanez Destroyer guitars. Also, my Carvin Bel Air tube amp, my Line 6 PODxt guitar processor, my Mackie 1604VLZ mixer and assorted rack effects. I do all of my recording into my computer using Cakewalk Sonar and Waves software. My audio card is a M-Audio Delta 44. The Destroyer is the absolute best guitar I have ever played. I bought it new in 1977 and would never get rid of it. Blows away ANY Gibson Explorer I have played. I kinda butchered it back in the 80's by adding a middle pickup and having a Kahler tremolo installed. I loved the Kahler but it ate strings at a rapid rate, so I had my luthier Rod Tuggle take it off and put a Gibson bridge and stop tailpiece on it. I want to build my own Explorer style guitar and have a curly maple top with a 59 Les Paul sunburst finish on it. Here is a closeup of the PODxt. This thing is fantastic for recording direct into the computer. It also sounds really great running through my Carvin tube amp as a pre-amp. 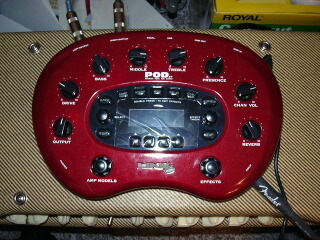 I usually run the POD into the guitar input of the Carvin. I have tried it through the effects loop, but I prefer the sound of it better going through the front end of the amp. 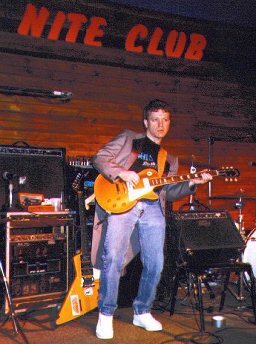 Here is a pic taken Feb 2, 2003 of my old band, Blind Date . We did a benefit for a good friend, Mike Schaffer. It was the first time we had played together in a year and a half. 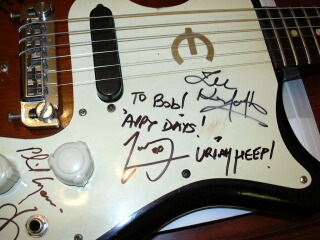 This is a closeup of my 1964 Epiphone Coronet, autographed by the members of Uriah Heep. The knobs are off an old Gibson BR lap steel guitar I used to own. Nice little guitar, but with the one pickup it's not very versatile. 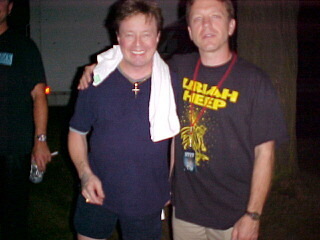 A shot of me and one of my all time guitar hero's, Rick Derringer. For those of you who have never heard of him, he was the singer of the 60's group "The McCoys" ... "Hang On Sloopy" was their big hit. He went on to work with some of the greatest musicians in rock like Edgar and Johnny Winter, Ronnie Montrose and others before embarking on a very successful solo career which included the mega hit "Rock & Roll Hootchie Koo". A great guy who is a born again Christian. 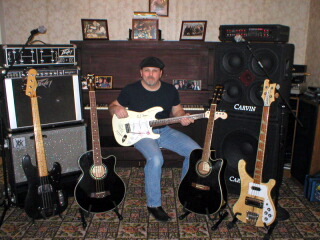 This is my buddy Mike "Muzzy" Fedysky from Pennsylvania and his gear. Looks like he is loaded with money from the amount of gear he's got. Thats why he's my buddy, he's got money ;-) He is the bass player on all of our "HeepHeads" projects. One heck of a songwriter and an even better bass player, I'm proud to be able to work with him. I first met Muzzy on the Heep website's chatroom, and we finally met in St. Louis in 1997 at the first Heepvention. He came here to the flatlands of Illinois in July of 2001 and we went to see Uriah Heep in Chicago together. This is my buddy Dave White (here with Mick Box onstage) from Cleveland. He is one of the founders of the whole Uriah Heep presence on the internet. A tireless man who is absolutely one of the best guitarists I know. His guitar and keyboard talents grace many, many Heepster related recordings. I met Dave on the net in 97 and we hit it off right off the bat and have been great friends ever since. We have got together several times since then. 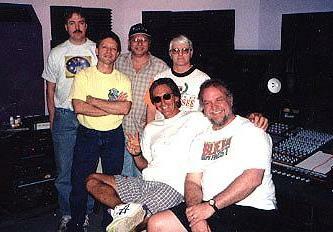 One of our big experiences was recording tunes for the Uriah Heep Tribute CD "Heepsteria" with our band Dreamer in July of 1998. We had the pleasure or working with Ken Hensley on this project, and he even played on 2 of our songs! Here we are in The Upper Room Studios in St. Louis. From left to right standing are, Mac Steagall-Bass, Me-guitars and vocals, Dave White-guitars and keyboards, Lannis Etheridge-videographer. 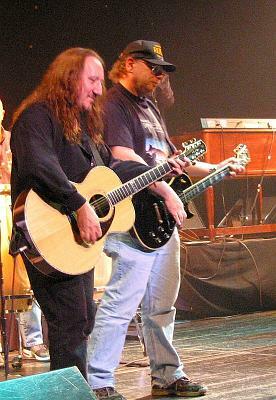 Seated are Ken Hensley-guitars and keyboards and Joe Doran-drums. Dave and I have worked on many projects together and there seems to be no end in sight. We just love to make new music. Here is a pic of some of what is coming in the future. From left to right, my 1977 Ibanez Destroyer (lawsuit model), which I purchased new, my friend Fred Williams's 1966 Vox Mark 12, my green ESP LTD 200 bass (on couch), my 1966 Epiphone Coronet (signed by the members of Uriah Heep), my Fender Telecaster (on couch), my Epiphone AJ15 acoustic (got it for $100), Fred's Fender Squier Stratocaster, and my Ibanez Les Paul copy, also bought new in 1976. 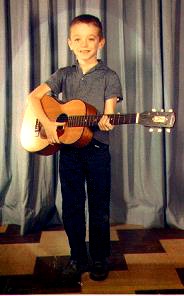 That was the first quality guitar I ever had. The amp in the pic is a Carvin MTS 3200 100 watt tube head. I altered it by making a ventilated face plate for the front of it to help in cooling the tubes. I got vain and added my name to it, only to return it to it's stock appearance later on. I traded it for a Carvin Bel Air 212 50 watt tube amp, and it is doing an awesome job live.